After doing the house blocks, Terry and I decided it would be fun to do another block together. 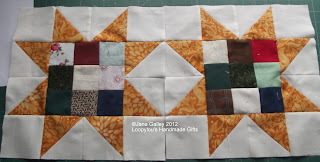 We decided on a scrappy star block to use up some scraps, and then Terry invited some more friends along. If you nip over to Terry's Blog, you'll see the participants in the side bar. If you click on the picture of the star block, it will take you to the pattern. If you want to join in, just let Terry know. These are the two blocks I've made for August, I can rest now until September. A very nice scrappy star. Very nice. I like the yellow points. I am not getting into this one. But I can't wait to see the stars you make. Very nice! Are you making all your points yellow, or will they all be different? Great blocks...I love your yellow star points! these are great blocks...I need to get in the mind frame that if i just would make single blocks eventually they turn into quilts. I havent done much piecing lately and at times i miss it. Very pretty! Will the outside gold be the same on all the stars? I really like that idea. I have pulled my fabrics and need to cut them out and sew them. Will do that sometime this week.